Sometimes it takes me a while to catch up with trends. I probably shouldn't admit that I've never made Cake Pops or Push-Up Cakes, and don't even get me started on the Macaron debacle! So, it should come as no surprise that I'm just now getting around to making Oreo Cookie Balls for the first time. The story sort of starts with the classic "why mess with a good thing" debate. I grew up dipping old-fashioned Oreos in milk. The end. I wasn't even the kind of kid who liked to twist them apart and lick off the cream. Probably because I always thought (and still do) that the cream by itself is just too sweet. I did like the plain cookie, but if I ate it, I'd just be wasting the cream. See my dilemma? But as my story usually goes, I give in. I succumb to the trend. I mean, a trend isn't a trend for no reason, right? People seem to like them. Plus, I like to try things at least once. Even if I'm a year or two behind everybody else. 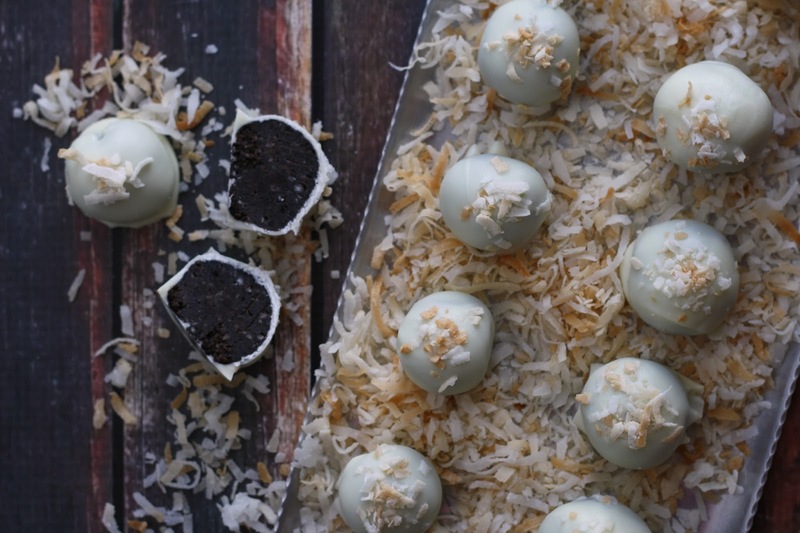 The main thing about making Oreo Cookie Balls is - they're super simple. The ingredients can be counted on one hand, the mixture comes together in a snap if you have a food processor, and they use the whole cookie! Your hands will get messy. There's no getting around it. If you don't do it on a regular basis, it can take a few tries to perfect your dipping technique. But really, I think as long as you go in knowing those things, you'll be good to go. Plus, it's fun to get messy sometimes, and it's satisfying to accomplish something that takes a little skill. They are also ultra-customizable. Switch up the flavor additions (or leave them out), go with a different flavored OREO, or use a different type of chocolate. Leave them plain, decorate them simply, or go all out. And for an adults-only party – add booze! 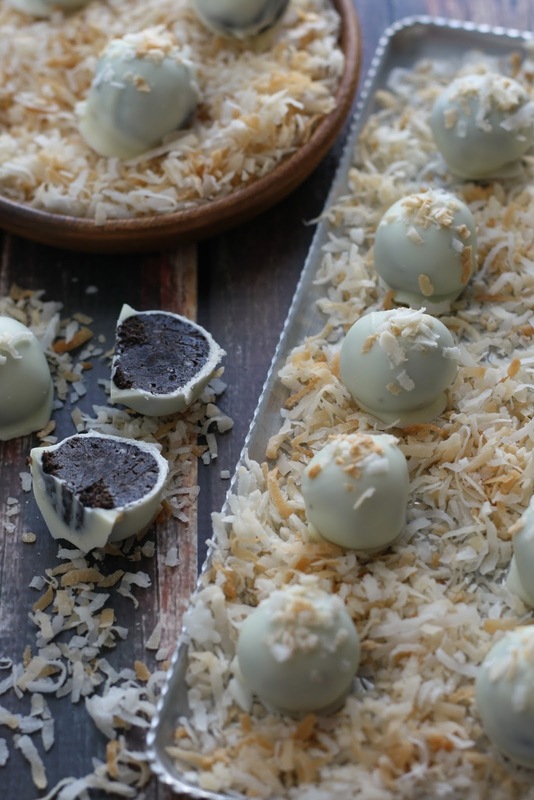 My Toasted Coconut version brings together two long-time friends, chocolate and coconut. Easy enough for any day, but pretty enough for a special occasion... and totally trendy! 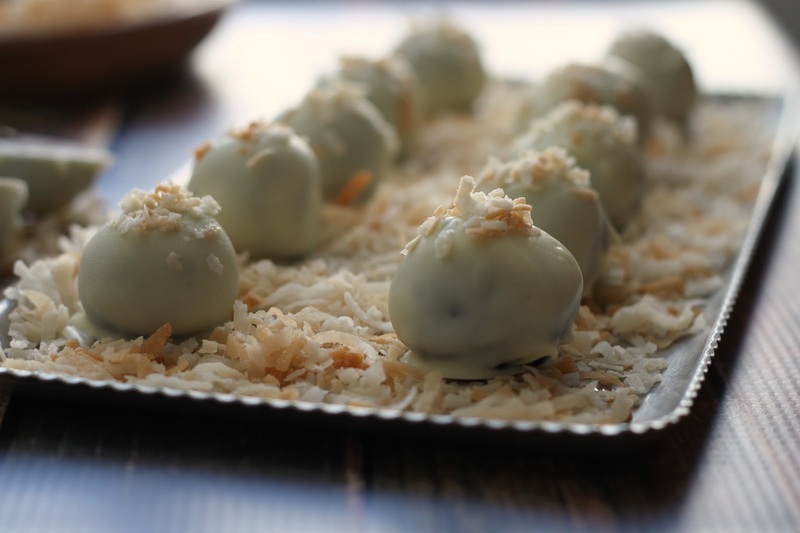 See my original Oreo Cookie Balls With a Hit of Coconut post and Oreo Cookie Balls Recipe at Food Fanatic.